It looks so easy--Just put your tips together and follow the blue dot! Site dedicated to serious skiers and boarders who just can't get enough. Monthly photo/journal updates for ski fun year 'round! SkiStreak.com: Every time you click a link an angel gets its skis. MONTHLY TRIVIA: Which North American ski area has the greatest skier capacity (services the greatest number of riders per hour)? "It's a gift. We don't talk about it much." 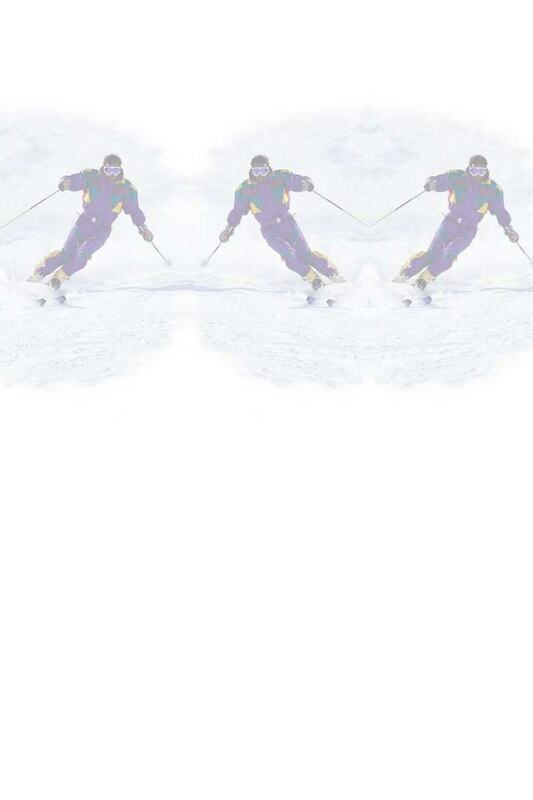 How many WEEKS in a row could a person ski without stopping? How many continuous MONTHS would it be possible to ski if one made a commitment to ski non-stop, no matter what; even in May, June, July, August, September and October? Through photos and notes this site chronicles a year-round skiing endeavor that began way back in 1992. 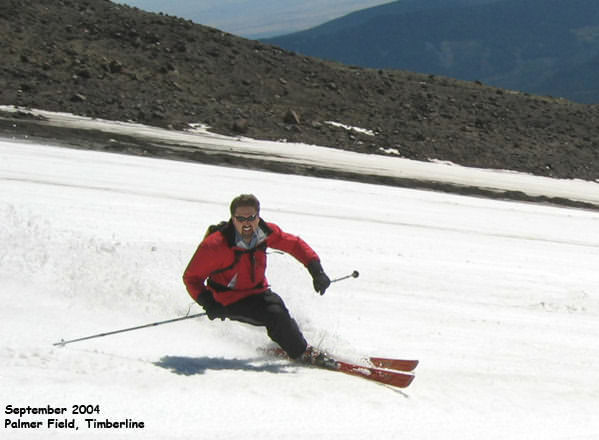 Ron was the first documented person in the world to alpine ski 91 straight weeks. His MONTHLY alpine streak continues into the 19th year. Check this site for streak photos, links, streak diaries, skistreak© magazine & newspaper articles, search engines, and snow reports from someone who just went skiing--no matter what month it is! Still doing a lot of catching up, including pics from some of the best powder years ever AND phenomenal powder trips to Chile and Argentina. 4th of July (154th month): This was truly a month of celebration. Snowbird was rockin! I talked to management and they were blown away by the crowds this month and this year. There were so many people this month and last that the tram had to run back-to-back almost every day they were open. Typically, in the late season, the tram is scheduled to run every 20 or 30 minutes. It was clear around Memorial Day that the schedule was out the window. There were too many people. I can only hope we're seeing a whole new level of expectation in Utah. June 2005: Snowbird is breaking all kinds of ticket records, the hungry throngs can't get enough, the conditions are primo....what is a resort to do? That's right. Stay Open! And that's precisely what the Bird is doing this season. They announced they will keep going until the 4th of July, conditions permitting. They haven't said that for 10 years. I am STOKED! May '05: 152nd Month: When quality conditions continue like this it's easy to continue producing quality shots. Here's some more amazing stuff from the best powder year in a long time... Powder, powder, everywhere! April '05: Alta, Snowbird, and the backcountry...another two pages of beautiful photos from the month! Mar 2005: Finally bagged a chute that I have been eyeing for years. On one of the few days of the season that it was actually open, I had a partner with me, the conditions were right, we had a window of visibility, we had our b/c gear.....we went for it. Pics of chute conquest, Whitepine, etc. Feb '05, 149th Month: February was by far the best month of the season to date. Rather than try to describe any of it here, I'll let the pictures tell the story. They are quite possibly the best series of photos I've ever posted on my ski site. Things slowed down a bit in terms of snowstorms. I had but one powder day in all of December, whereas in November it seemed every time I went it was a powder day. Nov 2004: November....Snowbird opened on the 5th! The earliest opening ever. OK, this kinda helps them make up for closing in early May when they could have stayed open until Memorial. Kinda. I took advantage of the heavy snowfall in the middle of the month and skied Alta. End of twelfth year: Thanks to Phil and Lisa's hospitality (Jay's sister) we had a great place to stay this trip. Ski Conditions were very good, especially compared to last September. See past logs link for pictures and comments on dozens of resorts, heli-skiing the Chugach in Alaska and exploring the famous Canadian gems Kicking Horse, Red, Fernie, Whistler, Blackcomb, Panorama, Lake Louise, Sunshine, and Norquay. Y-Couloir and Mt. Olympus, in the month of July (two famous chutes in Utah's Wasatch mountain range).